Cosmetic Dentist Wellesley MA | Many patients choose a cosmetic dentist to improve their smile’s appearance. Patients may want to correct discolored, chipped, misshaped, or missing teeth. In all, cosmetic dentistry includes a number of procedures. Thus, we have narrowed the 5 most commonly performed. Read below and contact us for more information. Dental restoration includes restoring a tooth to its natural appearance and function. Patients that have decayed, chipped, damaged, or missing teeth could be recommended to have dental restoration. This procedure includes composite-resin fillings, inlays, onlays, crowns, implants, bridges, and dentures. In general, composite-resin material and dental crowns are used to restore decayed, chipped, or damaged teeth. Composite-resin material is tooth-colored and is used for simple fillings or in more technical procedures such as inlays and onlays. Inlays are custom-made to fit within the cusps of the tooth. Whereas, onlays are used to cover one or more cusps. And lastly, dental crowns are used to replace the exposed portion of the tooth. They can be used on natural teeth or in conjunction with implants and bridges. Dental veneers are custom-made thin laminates that are placed in front of teeth. They correct teeth that are severely discolored, chipped, damaged, or misshaped. 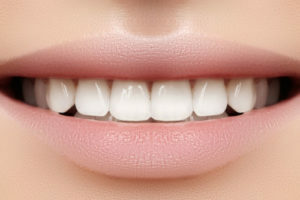 Dental veneers offer amazing results because they look very natural. Furthermore, veneers can last up to 10 years and require regular dental hygiene maintenance. Dental bonding uses composite-resin material to perfect teeth that are chipped, damaged, and misshaped. This procedure is similar to dental veneers. However, it typically costs less. Many patients choose bonding over veneers as a result. Yet, it is important to note that dental veneers are more stain-resistant. Dental bonding is also a quick procedure. The cosmetic dentist simply sculpts the material in layers to achieve the ideal result. Afterwards, a special light is used to harden the material. The procedure usually takes about an hour and no recovery time is needed. Professional teeth whitening is the most safe and effective method to improve tooth discoloration. In under 2 hours, teeth are lighten up to 8 shades by our cosmetic dentist. This procedure lasts about 3 years and offers amazing results for anyone interested in a brighter smile. In addition, professional teeth whitening can be done at-home using whitening trays. This method offers the same results in 7 days. Missing teeth increases the risk of decay, periodontal disease, unnatural teeth shifting, and jawbone deterioration. As a result, dental implants are the most recommended method for teeth replacement. They are titanium artificial tooth roots that are inserted into the jawbone to maintain its shape and density. Once the area heals, an abutment and dental crown are attached to finalize the tooth restoration. Cosmetic Dentist Wellesley MA | Learn more about improving your smile by speaking with our cosmetic dentist. Our team at Weston Dental Specialists Group is eager to assist. 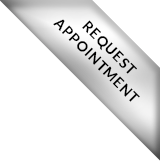 Schedule an appointment by calling (781) 894-0347 or request a call online. In addition, the dental office is located at 56 Colpitts Road Suite 4-6 Weston, MA 02493. November 12th, 2018 by weston | Comments Off on What is a Full Mouth Reconstruction? Prosthodontist Wellesley MA | Patients could be recommended to have a full mouth reconstruction to best improve their oral health. Reasons involve severe tooth decay, periodontal disease, tooth loss, and health disorders. As a result, we advise consulting with a prosthodontist as he or she is a specialist of dental reconstruction and teeth replacement. Learn more below. Then, contact us to schedule an exam and consultation. Patients with severe cases of missing or damaged teeth are recommended to have a full mouth reconstruction. To further explain, the procedure usually includes a combination of dental crowns, bridges, implants, veneers, contouring, teeth whitening, TMJ treatment, bruxism treatment, oral surgery, and periodontal disease treatment. Each full mouth reconstruction plan is customized to benefit the patient’s individual need. In addition, patients that have genetic disorders like ectodermal dysplasia, amelogenesis or dentinogenesis imperfecta benefit from full mouth reconstruction. Also, those that have suffered oral cancer may need the procedure to replace or repair teeth. A prosthodontist is a dental specialist that has undergone advanced education in dental restoration and teeth replacement. Dental restoration and replacement require a set of skills to offer the best and most natural results for patients. Hence, full mouth reconstructions are best performed by a prosthodontist. In addition, patients who are interested in cosmetic dentistry should consult with a prosthodontist. They are highly skilled professionals that provide and perform unique dental procedures. 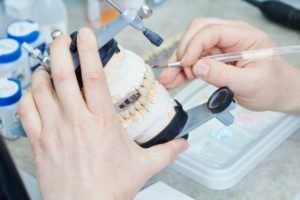 Overall, the advanced education and training offer the best understanding of a mouth’s structure, health preservation, and creation of tooth replacement. 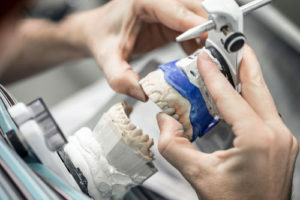 Prosthodontist Wellesley MA | As mentioned above, a full mouth reconstruction is best to consult with a prosthodontist. This procedure requires a skilled and experienced dental professional for the best, natural result. Book your consultation with Weston Dental Specialists Group today. Our advanced team of prosthodontists will examine your mouth and discuss the best treatment plan. Therefore, call (781) 894-0347 or request more information online. The dental office is located at 56 Colpitts Road Suite 4-6 Weston, MA 02493. Also, we proudly serve Wellesley MA residents and have been providing dental care since 1958. Deep Teeth Cleaning Wellesley MA | Teeth cleanings, in general, are recommended to maintain great oral health. They prevent oral issues like tooth decay, periodontal disease, and tooth loss. So, what is the difference between a teeth cleaning and a deep teeth cleaning? Great question. Learn about the difference below and schedule a consultation to see which one is right for you! A teeth cleaning is a preventative dental procedure that removes plaque and tartar from teeth and gum line. Although you may brush and floss regularly, plaque can still form on teeth. Plaque is a sticky film made of bacteria and food particles which can harden into tartar. These substances are the main cause of decay and periodontal disease. Most patients usually require teeth cleanings every 6 months. While, others may need more based on their needs. Teeth cleanings are usually performed by a dental hygienist. He or she uses a scaler and small mirror to effectively remove plaque and tartar. Later, a high-powered, electrical toothbrush polishes the teeth for a bright smile. You will also receive a consultation on how to better maintain a cleaner mouth. Deep teeth cleaning, or scaling and root planing, also removes plaque and tartar. The key difference is that a deep teeth cleaning goes below the gum line. Patients are recommended to have a deep teeth cleaning when there are signs of gingivitis or periodontal disease. Gingivitis is an inflammation of the gums due to bacterial buildup. Patients may notice red, bleeding gums, as a result. Left untreated, it progresses to periodontal disease which can cause tooth loss and other health issues like heart disease. Fortunately, deep teeth cleaning will relieve your gums. They will begin to heal as long as you maintain healthy dental hygiene. Therefore, we recommend brushing at least twice a day and flossing daily. If you are able to brush in between meals, great! Patients should also consider a healthier diet to avoid plaque and tartar. This includes eating less sugary and starchy foods and eating more fruits and vegetables. And of course, drink plenty of water. Deep Teeth Cleaning Wellesley MA | Weston Dental Specialists Group offers a variety of dental treatments to improve your oral health. Contact us today to learn about your ideal treatment plan. Call (781) 894-0347 or request more information here. Our office is located at 56 Colpitts Road Suite 4-6 Weston, MA 02493. Also, we have been servicing Wellesley and Weston residents since 1958. Laser Gum Treatment Weston MA | Laser gum treatment is the ideal solution for patients suffering from periodontal disease. Receding gums, tooth and dental implant loss are primarily affected by the disease. Fortunately, laser gum treatment allows patients to mend these effects quickly. Learn more about the benefits of laser gum treatment below. Also, be sure to contact us for more information. 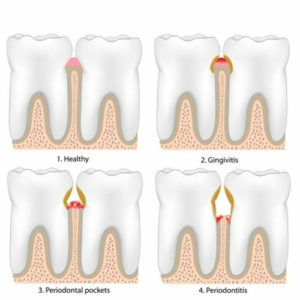 Periodontal (gum) disease is a chronic inflammation of the gums. Affected gums begin to recede which ultimately leads to tooth loss and dental implant failure, or peri-implantitis. Periodontal disease is also linked to major health concerns like heart disease, diabetes, and more. Therefore, patients are encouraged to maintain regular dental exams to detect the disease early on and avoid future complications. How is periodontal disease preventable? Periodontal disease is preventable by maintaining good dental hygiene. Patients should be brushing at least twice a day and flossing daily. Likewise, maintaining dental exams and cleanings further prevents the disease. In addition, eating a healthier diet and avoiding sweets keeps the teeth and gums healthier. Laser gum treatment is an FDA approved method of repairing affected gums and preserving teeth and dental implants. Therefore, dental office uses LANAP and LAPIP to effectively treat periodontal disease. What is LANAP and LAPIP? LANAP and LAPIP are laser gum treatments. LANAP is used for natural teeth. It precisely removes dead gum tissue and sterilizes the area at the same time. 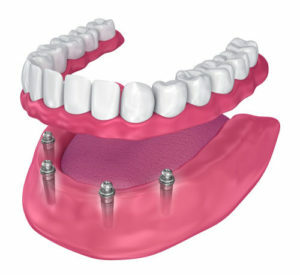 LAPIP is similar except that it is used around dental implants for more precision. Why is laser gum treatment preferred over traditional gum surgery? Laser Gum Treatment Weston MA | Periodontal disease is a condition that deserves immediate treatment. Our team at Weston Dental Specialists Group, is ready to assist. Schedule an exam and consultation to learn more about your treatment options. Call (781) 894-0347 or request more information here. Furthermore, you may also visit us at 56 Colpitts Road Suite 4-6 Weston, MA 02493. 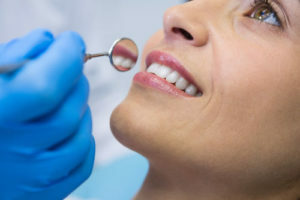 Prosthodontist Weston MA | Patients that are considering cosmetic and reconstructive dentistry should choose a skilled professional for best results. Prosthodontics is a dental speciality that focuses on dental restoration and teeth replacement. Therefore, these dental professionals are required to have additional education to specialize in this field. Learn more about prosthodontists and their specialization below. What does Cosmetic and Reconstructive Dentistry Include? Veneers are thin-laminates that are placed in front of teeth. They correct a variety of issues like misshapen, cracked, chipped, and discolored teeth. Crowns are tooth-like caps that cover the tooth. They appear and function like natural teeth and can last up to 10 years. 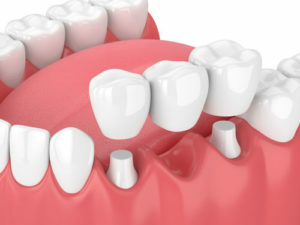 Bridges are used to replace one or multiple adjacent teeth. They adhere to existing neighboring teeth or to dental implants. Implants are recommended as a teeth replacement option. They are artificial titanium tooth roots that are inserted into the jaw. Dentures are removable mouth appliances. Patients choose them to replace some or all of their missing teeth. Learn more about the process of restoring or perfecting your smile today. Our team of prosthodontists will examine your oral health and recommend the best treatments. Call (781) 894-0347 or request more information here. Our office, Weston Dental Specialists Group, is located at 56 Colpitts Road Suite 4-6 Weston, MA 02493. Also, we proudly serve Wellesley MA residents. 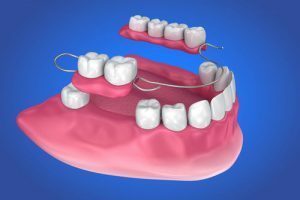 September 18th, 2018 by weston | Comments Off on What is a Dental Bridge? Dental Bridge Weston MA | Tooth loss can occur from oral issues like tooth decay, periodontal disease, and injury. Fortunately, patients can benefit from several teeth replacement options, like dental bridges. Considering replacing your missing teeth? Excellent decision! Learn more about the dental bridges and the benefits of teeth replacement below. A dental bridge Weston MA can replace a single tooth or multiple teeth. It is made of two dental crowns on each end with a pontic tooth or teeth in the middle. Dental bridges are permanent fixes that allow patients to chew better and speak clearer. They can be used with existing teeth or dental implants. Replacing missing teeth is crucial for your oral health. Missing teeth cause more dental issues like unnatural teeth shifting, tooth decay, periodontal disease, and more tooth loss. Patients are encouraged to avoid losing teeth by maintaining dental hygiene and visiting the dentist routinely. 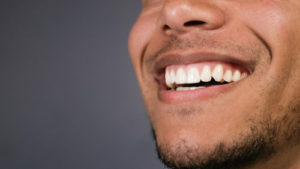 For example, a dental exam detects issues early on like small cavities while dental cleanings remove plaque and tartar. Each procedure will vary and usually requires more than one visit. If teeth will be used with the dental bridge, the dentist shapes the teeth in preparation of the dental crowns. Next, an impression and/or image is taken for the laboratory to create the bridge. You’ll receive a temporary bridge while you wait for the custom bridge. Once the bridge is ready, it is attached with cement for a permanent fix. 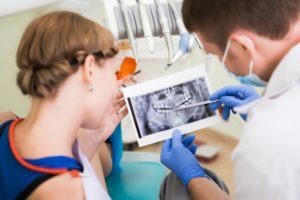 Dental Bridge Weston MA | A dental exam and consultation will be needed to determine your best option for teeth replacement. Contact our prosthodontist today. Call (781) 894-0347 or request more information here. Weston Dental Specialists Group would be delighted to explain your options and answer your questions. We are located at 56 Colpitts Road Suite 4-6 Weston, MA 02493. Also, we proudly serve Wellesley MA residents. Dental Cleaning Weston MA | Dental cleanings are not dreadful. They are actually quite enjoyable especially when you know what to expect. Wait? You’re not familiar with the procedure? That’s okay. Many people aren’t either. So, I’ll break it down into 5 simple steps. By the end of this blog, you’ll be an expert on dental cleanings! Before the cleaning, the dental hygienist uses a small mirror to search for signs of infection, gingivitis, or other oral concerns. If all is well, the hygenist proceeds with the cleaning. Your hygienist uses the same small mirror and a scaler to remove plaque and tartar from the teeth and gum line. It is normal to hear scraping. That is just the hygenist effectively removing the tartar. You can always minimize the build up by brushing your teeth after meals and flossing daily. Feel free to speak with the hygenist about better ways to keep your smile healthier. They have the best tips. Trust me. Now that your teeth are free from build up, your hygienist uses a professional electric brush to polish your teeth. You’ll taste a gritty toothpaste. This is normal. The grittiness allows the cleaning and polishing to be more effective. And, the taste will be similar to regular toothpaste. Some patients are concerned about their enamel during this step. However, this step is actually safe to do twice a year. This step is the easiest. Once the polishing is complete, you’ll rinse away the gritty toothpaste. Some patients may need additional dental protection. So, the next step may apply. This treatment helps protect your teeth from future decay. The hygenist inserts a mouthpiece filled with the fluoride paste into your mouth. The paste is left on your teeth for a minute. Or, the hygenist could also use a varnish that is brushed on your teeth and quickly hardens with saliva. These steps are helpful but every patient is different. Some may need additional treatments to obtain a healthier smile. Learn about your oral health status today. Our team can identify potential and existing dental issues while recommend treatment solutions. Contact Weston Dental Specialist Group at (781) 894-0347. Or, visit us at 56 Colpitts Road Suite 4-6 Weston, MA 02493. We also proudly serve Wellesley MA residents. Dentures Weston MA | Losing teeth as a young child is usually more exciting than when it happens as an adult. Why? If you left your tooth under a pillow, you may have received money or a small gift. As an adult, losing teeth is more of a worry. Fortunately, there are teeth replacement options like dentures. Let’s learn more about them below. Dentures are removable mouth appliances used for teeth replacement. As people get older, they may experience tooth loss from periodontal disease, serious decay, or injury. Patients that need full teeth replacement may consider complete dentures. And those who have experienced some tooth loss, can benefit from partial dentures. There are 3 Types of Dentures to Consider. Conventional – These dentures offer the best fit. However, they require a patient’s gums to completely heal after teeth removal before use. Gums can take a few weeks to recover but the dentures are being made during this time. Immediate – Immediate dentures are very convenient because a patient is able to wear them right after teeth removal. The patient then needs to return a few weeks later to have the dentures readjusted. Overdenture – Existing remaining teeth serve as an anchor for overdentures. This allows the dentures to be more stable. Patients can also use dental implants to stabilize the dentures. Periodontal disease and decay is avoidable with great dental hygiene. Be sure to brush effectively at least twice a day. Floss daily and visit us for your dental exams and cleanings. We can detect issues early on. Your oral health is very important. Contact the team at Weston Dental Specialist Group. Call (781) 894-0347 or visit us today at 56 Colpitts Road Suite 4-6 Weston, MA 02493. We offer a variety of dental solutions and can customize a treatment plan that is best for you. Dental Implants Weston MA | There are solutions for replacing missing teeth. You may have heard of traditional dentures or dental bridges. But how familiar are you with dental implants? 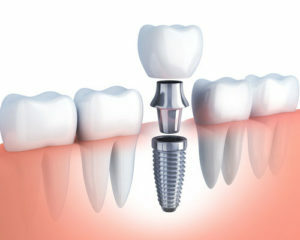 Dental implants are increasing popularity among patients due to their permanency and effectiveness in restoring smiles. Patients suffering from tooth loss and chronic dental issues benefit from dental implants. Learn why below. Dental implants are artificial titanium tooth roots which are inserted into the jaw bone. They not only replace teeth but are used to preserve the jaw bone, which can deteriorate from tooth loss. 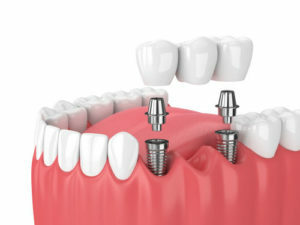 After a dental implant is inserted, it usually needs to heal before applying a dental crown. Recovery time could take weeks, although, there are situations when a dental crown can be inserted on the same day. Dental implants require the same care as regular teeth. This includes brushing teeth twice a day and flossing daily. Routine dental exams and cleanings are also important. Your dental hygiene efforts will avoid implant failure, which is also called peri-implantitis. Dental implants involve 3 parts. When replacing missing teeth, 3 parts are considered: implant screw, abutment, and dental crown. The implant screw is inserted into the jaw bone. 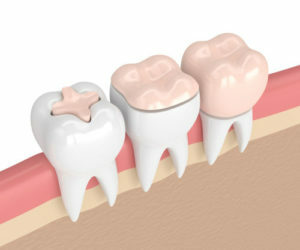 The abutment works as a connector for the dental crown. And, the dental crown is custom-made to fit in your mouth comfortably and appear natural. Dental implants can also be used in conjunction with dentures to offer more stability. Visit us for dental implants. Weston Dental Specialists Group is an experienced team of prosthodontists in Weston MA. We are located at 56 Colpitts Road Suite 4-6 Weston, MA 02493. Contact us today to schedule an exam and consultation. Call (781) 894-0347. Dental implants are the most recommended option for teeth replacement. Allow us to explain your unique procedure and offer you the best dental treatment plan for your oral health.